The firs trailer for Neill Blomkamp's whimsical and bloody robot coming-of-age story Chappie has arrived! Imagine a story about a kid from a dysfunctional family struggling to do good... but the kid just happens to be a machine. 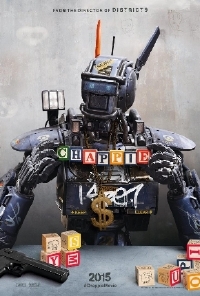 After being kidnapped by two criminals (Yo-Landi Vi$$er and Ninja of Die Antwoord) during birth, Chappie becomes the adopted son in a strange and dysfunctional family. Chappie is preternaturally gifted, one of a kind, a prodigy. He also happens to be a robot. Chappie stars Blomkamp staple Sharlto Copley in the mo-cap role of Chappie. Written by Blomkamp and his wife Terri Tatchell, the March 6, 2015 release is produced by Simon Kinberg and stars Sharlto Copley, Hugh Jackman, Dev Patel, Sigourney Weaver, Ninja, Yolandi Visser, Jose Pablo Cantillo, and Brandon Auret. Chappie is loosely based on Blomkamp's 2004 short film Tetra Vaal, which solidified the filmmaker's unique style. i cry. die antwoord FTW!!! if you like this you have to watch Aut&Atilde;&sup3;mata (2014) with Antonio Banderas. the imdb score if much too low.